Learn while you play with the Famous Figures of the Renaissance Movable Paper Figures to Cut, Color, and Assemble. 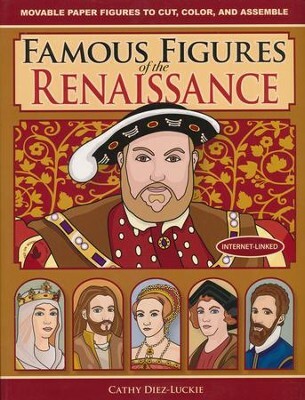 Designed for ages 6 to 12 years, kids can travel back in time to the Renaissance with Johannes Gutenberg, Christopher Columbus, Isabella I, Leonardo da Vinci, Michelangelo, Martin Luther, Henry VII, Elizabeth I, William Shakespeare, and Galileo Galilei. Printed on wood-free cardstock; 48-pages. I'm the author/artist and I want to review Famous Figures of the Renaissance: Movable Paper Figures to Cut, Color, and Assemble.